Some of my first memories of our tiny country church are in the first pew, sitting right next to my great-grandmother. After raising my grandmother and great aunts, she turned her energies to her job as a second grade teacher at a local Christian School. During that time, Nana’s watchful eye was over her eight grandchildren, and after a few more years, her sixteen great-grandchildren. Even in her early nineties, she was sharp and intent on preserving the traditions she worked throughout her adulthood to put in place. When I reflect on my time spent in the front pew with Nana, two things strike me. First, she knew the vital importance of practicing what you preach. She believed we should attend church, and expected us to be reverent, polite, and helpful to others. Since she had spent the better part of nine decades doing these very things, who were we to argue? One place where we do not meet this pushback is with the music. Somehow, it has stuck with our daughters that the songs in the hymnal on our piano at home are the same words and notes sung by their extended family all around the East Coast. These are the same songs we sang at their Godparents’ weddings, baby’s baptisms and the funerals of those we love. These are the same words they hear their father singing while he feeds our dogs in the morning and the same tune of the lullabies that rock them to sleep at night. There is no doubt, music has its way of imprinting in our memories. While scripture, creeds and the sacred act of Communion bring great solace to our hearts as adults, music helps me look at our worship through the eyes of my daughters. Their innocence, coupled with their desire to make sense of what is going on in the world around them, leads them back to the organ instead of the altar. Long before they learn to read, they can participate in our worship through the familiar tunes they have heard since the womb. I have tried to pinpoint what it is about music that is such a draw for my children and I think it has so much to do with their ability to participate and connect to the larger world around them. Or, maybe, it’s due to its simplicity or that they can relate what they are doing in church to what they experience at home. Or, perhaps, it goes deeper than that, to the chemistry of our brains. Anytime I visit my own grandmother, who is in the final stages of her battle with Alzheimer’s, her eyes light up with the recognition of the notes she hears her great-granddaughter’s play. And my own eyes light with the same peaceful joy when I hear my kindergartener sing sweetly from the choir loft, in the same notes I heard my aunts sing from the pews of that tiny country church, all those years ago. What songs do you remember singing with your grandparents? How has music helped your children connect what’s happening at church to what’s happening at home? I grew up in the Methodist/ Baptist traditions and can still sing most of the verses of the songs and hymns I learned then. My own kids though, struggle with traditional songs from the Episcopal hymnal, which are difficult to remember and far less melodic (Lift Every Voice and Sing is the exception). Honestly, it can feel like I’m cheating my children as they struggle through chant-based songs without time signatures or discernable tunes–so different from my rollicking “hymn sing” experiences as a kid. Has your church made a determined effort to incorporate more “memorable” hymns? What a great question! Thank you, Meredith. I have memories of trying to learn the service music (I think that’s what they call the S-songs at the front of the hymnal) in choir as a child, and being completely confused. Needless to say, those songs didn’t really stick with me into adulthood. Our music director does a great job incorporating what my cousin calls “The Greatest Hits” into our worship each week– songs that are popular across many Christian traditions and that have been made into pop culture songs (at least on the Christian music circuit) as well. Those are definitely the songs that stick with my daughters the most. 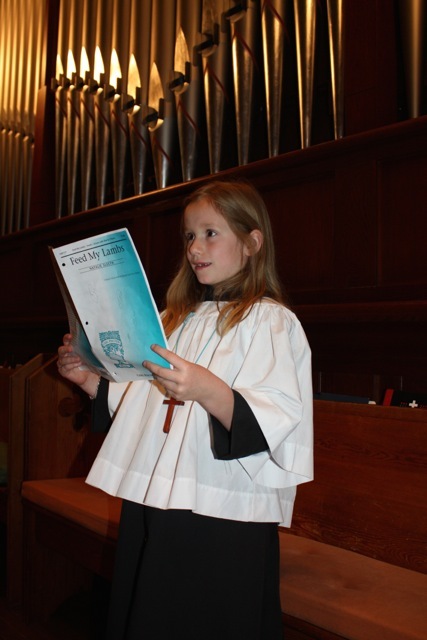 And our music director also teaches the more memorable hymns and easier chants during children’s chapel, so that as the kids grow, they are familiar with what is happening in the service. I also found that there is a channel on Pandora that offers Episcopalian hymns, and my daughters enjoy listening to that as well. I hope this helps! I remember the sound of old hymns in my grandparents’ house. Such beautiful memories! I love that your grandmother sat right at the front – the best place to sit so children have a good view of what is happening and feel a part of it.